Cadillac Printing Company was founded in 1921. The company first changed hands in 1938 when Carl Rausch and George Moak assumed ownership of the growing shop. Throughout the Great Depression and World War II years, Rauch and George kept the printing machines humming at the Mitchell Street firm. Many Cadillac boys who served their country during World War II, including Rauch’s son-in-law, had difficulty finding employment upon returning home from the front. After coming back from the war, Rausch put his son-in-law to work at the shop, along with the soldier’s best friend, Clarence “Shag” Townsend. Fortunate to have a job, the 25-year-old Townsend applied himself to learning the print trade. 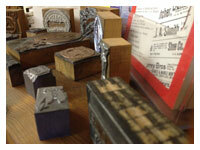 He began as a letterpress man and worked in the bindery department. 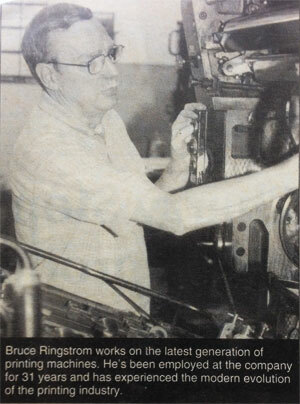 By 1960, Rausch was ready to move on with his life and so was Townsend, who then purchased the print shop from Rausch. 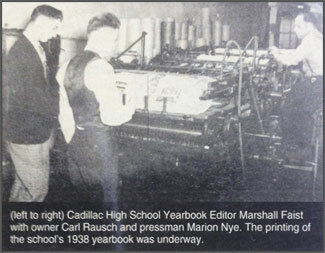 At this period in its history, Cadillac Printing was the largest printing firm in Michigan. The business continually and successfully adapted to rapid changes in the market place, expanding its manufacturing client base, while increasing attention to the growing Northern Michigan tourism and hospitality industries. It set new standards for the regional market by being the first shop in the area to produce 4-color work on letterpress. Color printing was here to stay and the industry became more sophisticated with each passing year. The decade of the 1960s heralded the birth of the new technology age, and as it had in the past, Cadillac Printing assimilated new wave practices into its operation. It was around 1965 that a fresh young face appeared regularly at the shop. Townsend’s son, Mike, began stopping by after school to help out the family business. Like his father before him, he applied himself to learning the trade from the bottom up, gradually assuming greater responsibilities. The Younger Townsend eventually committed his career to the business and became it’s second-generation owner in 1990 when he purchased the firm in partnership with father-in-law Orren Tate. As fate would have it, it would be the younger Townsend who would guide Cadillac Printing through the firm’s test of fire—the digital revolution of the 1990s, a challenge that required the investment of hundreds of thousands of dollars in both time and equipment. Not only was this transformation extremely costly for the small business, it was a frustrating trial and error process with a wide learning curve. Cadillac Printing surfaced from the print worlds metamorphosis as a healthy company. Yet it’s greatest challenge was still to come. In the fall of 1996, Townsend suffered a severe closed-head injury as the result of an auto accident. Following his recovery Townsend returned to work, but was unable to function in the same capacity as he had prior to the incident. In the midst of personal and financial hard-ship, the Townsend family rallied forces to save the business. Townsend praises his wife Tammy, and his in-laws, Orren and Patty Tate, saying they invested heart, soul and finances into the rescue, while the company’s long-term employees held steadfast throughout the storm. Forced to restructure the firm following the crisis, the company became a leaner more efficient operation. It enters its 93rd year of operation with solid confidence stemming from a few tried and true rules of thumb for survival. Townsend believes success in today’s business climate demands the creation of niche markets. In the late 1990s, Cadillac Printing moved into a unique position in the printing community when it developed its ability to produce foreign language operating manuals for the overseas market. The niche is geared for the manufacturing sector and Cadillac Printing produces work for six industrial clients in 36 languages including Chinese, Czechoslovakian, Arabic, Hebrew, Philipino and others. Other niches Cadillac Printing has in its pocket include voting ballots and maps. These markets complement a base of traditional print jobs including brochures, newsletters and advertising materials. “You can’t be everything to everybody,” Townsend said. But, adhering to one of its rules of thumb, he said the company tries to be all things to its major customers. Empowered by these basic strategies and the commitment of its 13-member staff, Cadillac Printing Company forges ahead toward the century mark convinced that has the muscle to continue to triumph over unforeseen obstacles, wavering economic cycles and the rigorous demands of the new digital age. It is with heavy hearts that the family of Michael Grant Townsend announce his passing on April 3 at age 64. Mike bravely faced his diagnosis of metastatic melanoma with quiet resolve. Mike lived his life in a reserved and humble manner and made an indelible mark on the lives of those who knew him, known for his extraordinary kindness, sense of humor & humility. He was the friendly face of Cadillac Printing Co. to many of our clients in his 40 years of owning and managing the... shop, naturally gaining their friendship, and the friendship of his employees, with his relaxed style. Mike’s real passion was spending his days on the water fishing. We know he is now fishing the rivers of heaven that are filled with healing waters (also steelhead & trout)!